The completion of a building's construction is not the end of the project. Construction companies don't work without making a mess of the place, which is why post construction cleaning is a fundamental part of the process. Without it, your site would have no real purpose. Trying to handle this mission on your own would be near impossible, time consuming and substandard. Conversely, by hiring commercial cleaning South Bend IN, you can have the cleaning chore completed professionally, with zero debris and leftover materials from the construction in your commercial structure. South Bend Junk Removal ensures that your building is clean and safe. If you had your restaurant newly constructed, for example, it is highly recommended to hire a professional cleaning team to scrub the building to sanitize it. After all, commercial sites are constantly accessed by people. As the boss of a public building, it is your responsibility to ensure that hygiene and cleanliness is constantly maintained. This is necessary even when the structure is newly built: there can be items there such as chemicals, cigarette butts, metal, glass and the like from the construction that could be hazardous for the unsuspecting community. Hence, post construction cleaning not only makes space look spotless, but it also eliminates risks from such elements. 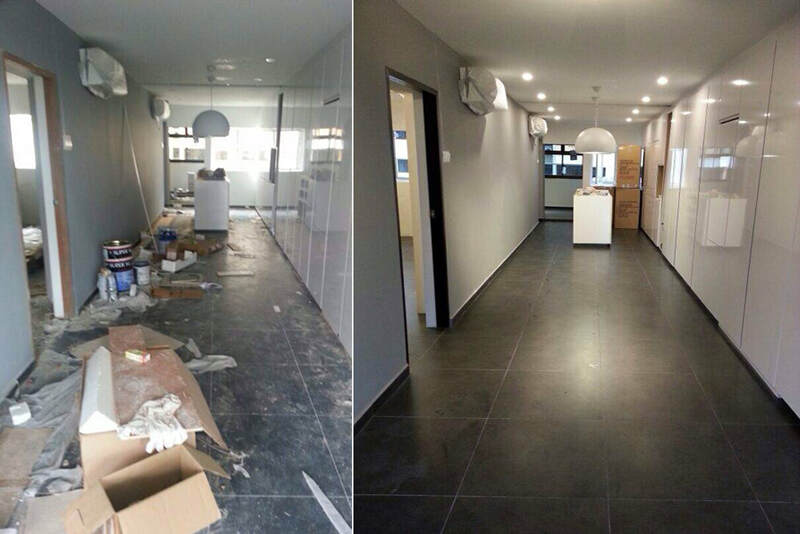 Construction Cleanup Service Company will undertake the following cleaning services along with additional cleaning tasks from floor to ceiling in accordance to your needs.• Dusting and swabbing hard surface floors.• Vacuuming all carpets.• Dusting all walls, doors, door knobs, switches.• Scrubbing windows, glass doors and other glass surfaces.• Dusting doors, knobs, baseboards, switches.• Shinning mirrors, bathroom accessories, cabinets and plumbing fixtures. • Cleaning household appliances; removing packing materials, temporary labels.• Placing kitchen drawers.• Cleaning door and window frames, tracks, and sills.• Cleaning water regulator and water heaters.• Cleaning storage areas, garages, furnace closets.• Polishing goods with stained woodwork and stainless steel.• Scrubbing sinks, toilets, and tubs. Choosing Post Construction Cleaning Company Before hiring a commercial cleaning service, you will need an estimate of the overall cost. The amount of cleanup that needs to be done as well as the size of the building will influence the quote. Approach several post construction cleaning services and have them estimate the price by measuring the area and the amount to be cleaned. Choose the company that best fits your budget. Most services may be open to negotiation if you have a very large area that needs attention. Settle the price before the sanitizing work begins. However, before selecting a service, request client testimonies. A legitimate and quality commercial cleaning South Bend IN company will readily agree to let you contact their ex-clients. Once you find the right company, you can be assured of the completion of your building project. By now, you should have a very good idea on why you need new construction house cleaning company to do the job for you, and may even be thinking about getting professional janitorial services after the cleanup is done. Be careful in choosing your company, because a great construction cleanup company is a real asset - not a hassle. Good luck with choosing a company that best fits your needs. South Bend Junk Removal is a widely recognized commercial cleaning company that specializes in construction cleanup, office cleaning, and full-service janitorial services.